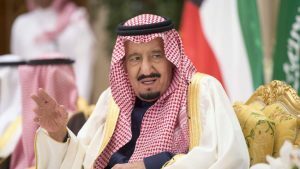 Saudi King Salman Bin Abdulaziz will not meet up other world leaders in Germany this weekend in the framework of the G-20 Summit in Hamburg. German government spokesperson Steffen Seibert told Germany’s state news agency DPA that the 81-year old monarch will be represented by his finance minister Mohammed al-Jadaan. “The government has received official notification that King Salman will not travel to the G20 summit,” the German official said. The city of Hamburg is hosting July 7-8 leaders of industrialized and emerging economies. President Donald Trump and Russian leader Vladimir Putin are expected to attend. The Saudi delegation had rented out Hamburg’s luxury Vier Jahreszeiten (Four Seasons) hotel in its entirety for the king and his party, German media had reported. The Saudi royal palace did not explain why the King is pulling out from the summit. The pullout comes amid buzzing gulf crisis between Qatar and the Saudi-led bloc including the United Arab Emirates, Bahrain and Egypt. Monday, Qatar handed its response to the bloc over the 13-demand list issued as condition to lift the sea, air and land blockades imposed on Qatar following diplomatic spat. The response came few hours after the bloc agreed to extend Sunday deadline by 48 hours. Posted by KanelkaTagba on Jul 4 2017. Filed under Gulf News, Headlines. You can follow any responses to this entry through the RSS 2.0. Both comments and pings are currently closed.